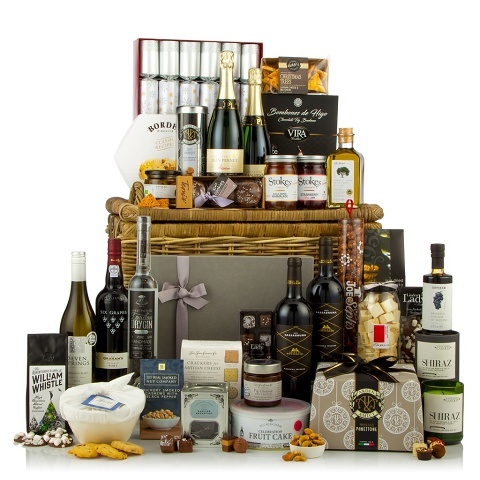 A beautiful kubu trunk containing a luxurious feast of distinctive and moreish seasonal food and wine including bites, nuts, cake, biscuits and chocolate. Your lucky recipient really will feel as if they've sunk into a decadent winter wonderland scene. Will they start with The Fine Cheese Co. Crackers for Artisan Cheese or will the Linden Lady Handmade Giant Milk Chocolate Buttons with Marshmallows be opened first? Or perhaps the buttery Arden & Amici Prosecco Panettone Our Snowed In hamper is a spectacularly thoughtful and premium Christmas gift choice.